Both weight loss and math can seem mysterious at times. After discussing it all with my Chinese tutor, who grew up in Taiwan, I have to think that the subjects of weight loss and math are cross-cultural in many important ways. In today’s post, I attempt to combine the themes in a way that helps me practice math vocabulary, while being humorously philosophical about weight loss. In some ways, the conditions for losing weight are easy. You only need to eat comparatively less food and that will do it. However, some people will tell you you should only eat meat, just like cavemen. As well, some people will tell you it is best to eat only vegetables! Many people say it is important to add more fat in your diet. In many books it says you should decrease the amount of carbohydrates you eat. Everyone says that if you eat correctly your energy will be greatly increased! If you add together all the advice about your diet, then use moderation, you may perhaps come to find a way that resolves it all. You can eat whatever food makes your body feel good. If the food you eat equals the energy you use, if your body feels good, naturally you will be healthy. This is weight loss math! 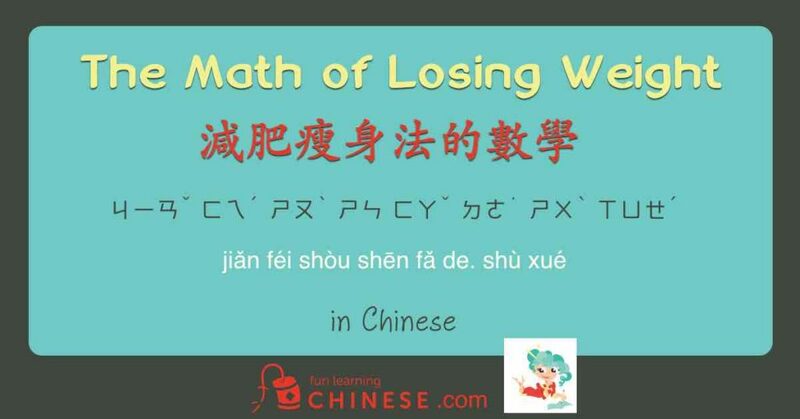 ❶ Just like in English, sometimes it is considered more polite or comfortable to talk about losing weight 重 ㄓㄨㄥˋ (zhòng) instead of losing fat 肥 ㄈㄟˊ (féi). ❷ This sentence would still be understood without adding this word, but we wanted to be very descriptive. ❸ 對 is one of the most common responses in Chinese conversation, like in English we when we respond positively with yes. The literal translation of 對 is most often correct or towards. ❹ 以 is used here instead of 用 ㄩㄥˋ(yòng) to avoid repetitive sounds in the sentence. ❺ This is an idiom based on the Confucian concept called the golden mean. 中庸 is the specific characters for golden mean. You will recognize the 中 when referring to Chinese language, food, or countries. It means middle or center. The 庸 can mean common or ordinary. 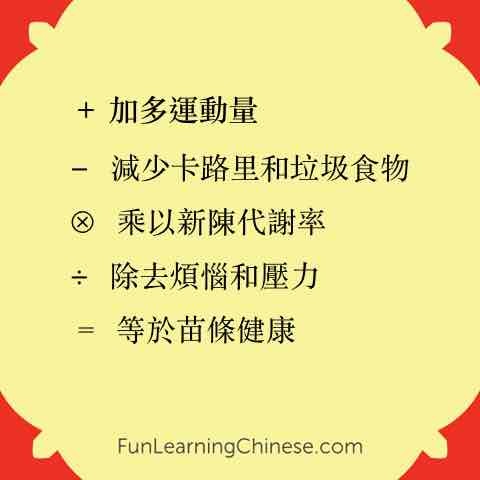 之 is another adjective marker, letting us know that 中庸 is describing something that will follow. 道 means road or path, here in a metaphorical sense. Thus, the whole idiom can be translated as the middle way or the way of moderation. ❻ My tutor says this is a very common phrase. It is used for referring to actions that were the obvious or almost reflexive choice. If you think of metabolism as the creation of new fresh energy to replace declining energy, it might help you remember this extra long word!